In desktop versions of Outlook, you can check the spelling in your email message at any time by clicking Review > Spelling & Grammar. 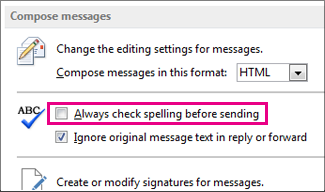 If you don’t want to check spelling manually for every message—or you’re worried you might forget!—you can set Outlook to check spelling for you every time. In Office 365 Outlook - Outlook on the web - there is no built-in spellcheck. Instead, use your web browser for spellcheck. Most web browsers such as Chrome, Internet Explorer, and FireFox have spellcheck. If your web browser doesn't have it, you can search the Internet to get the add-on for your browser. If you're using Windows 8 or later, another option is to go to your PC Settings and search for Autocorrect misspelled words and Highlight misspelled words. Turn on both of these.